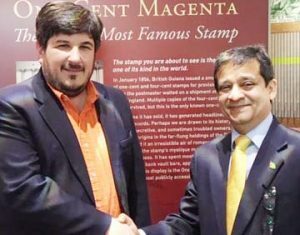 The British Guiana One-Cent Magenta, the world’s rarest and most expensive stamp, is currently on loan to the Smithsonian National Postal Museum by its owner, world-renowned shoe designer, Stuart Weitzman. Recently, Ambassador of the Co-operative Republic of Guyana to the United States, Mr. Riyad Insanally, visited the museum in Washington, DC to view the stamp. He said he was “delighted to see a bit of Guyanese history” and looked forward to the day when the stamp could be displayed in Guyana. The One-Cent Magenta will be on display at the Smithsonian National Postal Museum indefinitely. 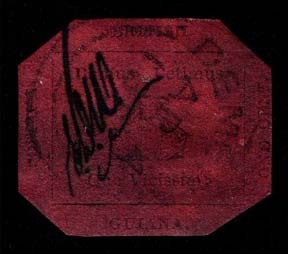 The One-Cent Magenta stamp has been hidden from view for a significant part of its more than 150-year history. Luxury shoe designer Stuart Weitzman had reportedly acquired the stamp for US$9.5M several years ago but it is said to worth much more now. That colorful history of US$9.5 million tag —almost one billion times its face value —is chronicled in a new book by New York Times reporter James Barron. It’s said to be the only British colonial stamp Queen Elizabeth does not own.